As my claimed kin says: "Fun fun fun!!!" She tore a two inch hole through the middle of a target and dug a frickin' hole in the berm with the AK-47--granted, it was only 25 yards, but it was her first time shooting rifle (and then only a bolt-action .22) in 15 years. She did well with my CZ-82, but rocked my heart's brother's .357 revolver. I'm going to bet she's going to be in the market for at least a steel-framed .38. I didn't get much shooting in. My .22 didn't like the Winchester ammo that was all Walmart was carrying today (either wouldn't feed or wouldn't extract--sometimes both--and no, the gun didn't need oiled), and the 9mm Hi-Point has sat too long unloved in its case next to the nightstand, and was sulking. It needs to be taken down and cleaned and oiled. My Kimber .22 upper doesn't fit my STI Spartan--it's too tight, and I don't know what to do other than sigh and put it away. But today wasn't about me, but about my friend. My friend and I will be doing this again, though. And next time...next time...I'm bringing Odysseus's AR-15, and probably my Mauser .308, and maybe my Mosin-Nagant carbine. Because it seems like my friend likes recoil just as much as I do, and she's not currently breastfeeding. I'm getting some range time tomorrow. It's not all just for me, though--I'm going to be teaching a very good friend (claimed kin--her mom was my male genetic donor's first wife's second cousin, and my mom was wife #3) a bit about shooting. She's shot a bit, but mostly rifle. I'll be taking her out for some handgun tomorrow. She doesn't know much of anything about guns--except what she's seen in the movies, which is wrong. I've told her the four rules, and her reaction was priceless: she blinked and said something along the lines of why do those need to be articulated? They're just common sense. She's earned a post-graduate degree in an area of studies that tilts farther left than the English department, and has been put into contact with those disadvantaged individuals similar to those who make up the Occupy Whatever movement--only, not so middle class to wealthy in background. She's had a major wake up since then, and has come over to the Dark Side (we have cookies--nice, fresh, warm, oatmeal chocolate chip cookies) of conservatism and prepping. Part of that, she rightly concludes, is being prepared to defend herself. Thus, the range trip. I plan to take a few guns--mostly .22 for learning the basics, followed by defensive pieces like my beloved CZ-82, and a couple of others (at least one of which will be in her affordability range). I will not bring the Charter airweight snubbie .38--I'm an experienced novice, and I hate that gun. It kicks. Hard. Even with the nice, rubber grips. No way am I exposing a good friend with next to no experience to that (her husband, on the other hand...but that's a different story, and one I don't have permission to share). I also don't want to influence her against revolvers (though my personal preferences lean toward autos), so I'm having another good friend come along, and bring a full sized, steel-framed .357 and some underpowered .38 rounds (he doesn't have such a critter as a .22 revolver, and Odysseus's revolver only likes him). So, to any more experienced teacher: eyes, ears, breasts (important for a woman whose shirt will gape when she uses the Weaver stance, as mine does, and as hers will) protected; muzzle, target, trigger discipline. Safe storage--which means out of the reach of children small and large. Proper maintenance--cleaning and making sure parts that rub together are properly lubricated. What else do I need to make sure she knows? This—the Mosin-Nagant 1891/30, sniper. Because I love my carbine, but can’t see a target at 100 yards as anything other than a white blur. And my carbine is so pretty I’d hate to muck with it trying to fix it when it isn’t the gun that’s defective. This—the CZ 527, a .223 bolt action. I had a chance to handle one, a few years back. The bolt was smooth, and the trigger broke crisp and clean, like a spring morning after an overnight rain. I wanted, bad, but it wasn’t in the budget until it’d already walked out the door. 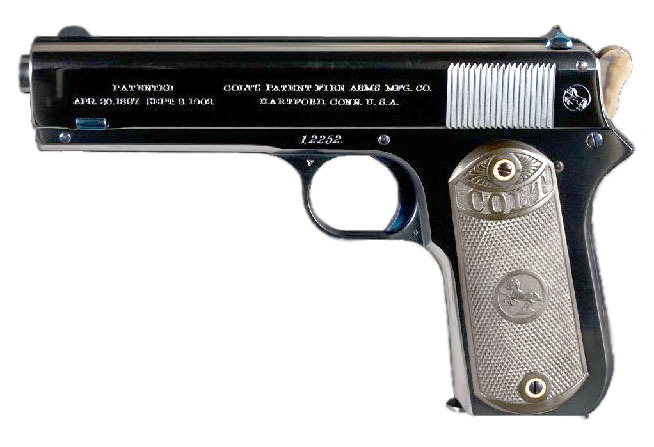 This—a 1903 Colt pocket hammer. I’ve got its larger, younger brother, but I’d love one of these, too. This—a CZ-82. 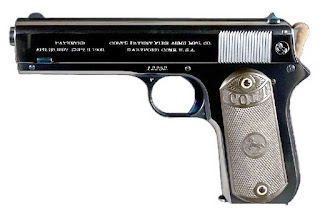 Has to be the 82: I really like the Makarov round. Yes, I already have one. I love my gun. I would like another just like it. Why? Because. It just makes me smile. This. An M1918. Just because. No practical reason. Just want one. Pretty, isn't it? Finally finished the blog grading for my students. This week, that consisted of taking each of their blogs and creating a permanent link in the course website under their name (for two classes), then going through and looking at what they'd managed to do in their first week of blogging, and making sure that everybody commented on someone else's blog. Most didn't. Most are a few points down on that front. Then I had to email each student (two classes X 23 students + a couple of replies to a couple of questions = a LOT of writing today). Suffice it to say, grading the blogs this week took about three times as long as it will for the rest of the semester. Most times, I'm done in about an hour and a half per class. Yes, that's right--those of you who are new here since last August, yes, my students blog for credit. My Comp I students write 900 words/week (3 post at 300 words/post) summarizing and responding to current events (and then commenting on each others' blog posts), and my Comp II students write 1000 words/week (one 500 word post over anything, one 500 word persuasive post supported by three links) plus commenting on each others' posts. Tomorrow starts everything all over again--I also help a colleague grade his online literature course, and his students post three times per week. There's about 23 students in that course, too, and "he" has to give feedback to each one. I love teaching. I love helping people figure out how to do something they've never done before, love helping them figure out that they can. Yes, I have my special snowflakes that want everything done for them, but they don't count, and likely won't ever count in anybody's world except their own. I do love teaching, but I hate the grading. I teach for free--the reason they pay me is because I have to grade papers/blogs/class participation threads on the course discussion board. Some people need to be discriminated against. I don't EVEN think so. Sounds like Paterno's case was kicked upstairs. I wanna move to Freehold! As if we needed any more proof. 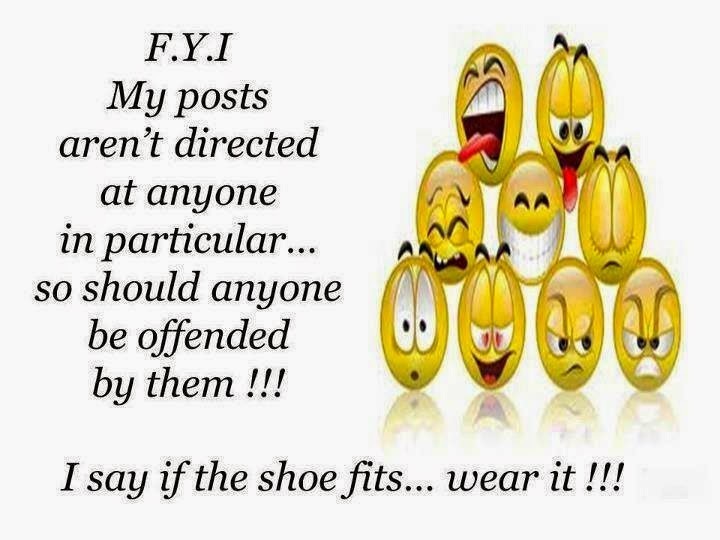 FFOT: NOT WORTH GETTING ANGRY ABOUT?!??! !